"Titan is unquestionably a “must have” product for anyone involved in audio post production for film or TV. With the advent of a feature for bulk de-mutiplexing of poly wave files, this program can shave an entire day off the turnaround of distribution of elements from the picture department to sound editors. Copy protected with iLok to allow the program to be easy moved. Backwards compatibility – Also comes with a copy of Titan 3.1.4 for compatibility with Pro Tools 6 and earlier sessions. Upgrades can be purchased at the store. You can download and try Titan 4 for 14 days at downloads. What's new in Titan 3.1? Titan's Fix Sync function automatically adjusts the position of manually or auto-conformed audio regions to sync precisely to a work track. Similarly the Fix Sync function can correct the sync of audio that has passed through signal processing devices and has been delayed by unknown amounts. 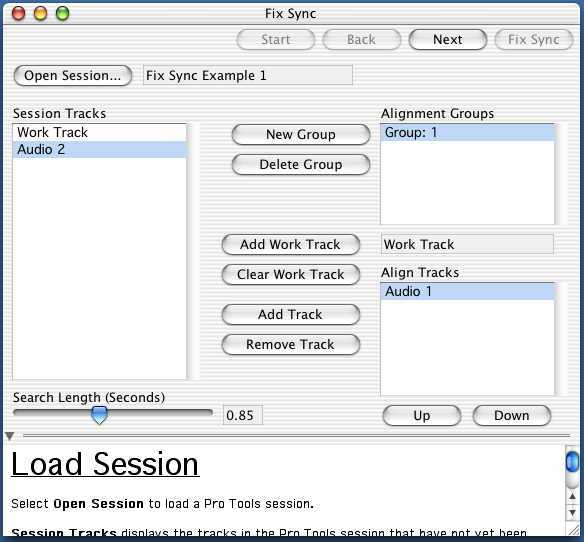 Fix Sync virtually eliminates the need to adjust sync manually while listening for phasing or visually comparing waveforms with a worktrack. Automatically corrects the position of audio that is out of sync by up to +/- 2.0 seconds to sample level accuracy. Hundreds of regions are corrected in minutes. Multi-channel Regions can be adjusted together to maintain phase relationship. Optional report indicates magnitude of errors, detection of signal inversion (180º phase shifts) and amount of shifting done. Flash Cutter, avoids having manually to re-cut and rename edits in situations when tape is used to transfer audio from any editing system to a Pro Tools system, and an OMF transfer is not a practical option. Once the audio on tape has been transferred into continuous tracks in a Pro Tools session and correctly positioned, Flash Cutter uses a standard EDL from the first editing system to automatically re-cut the tracks and rename the audio regions. Automatically cuts and names several hundred edits in seconds. Simple assignment of EDL channels to Session Tracks. 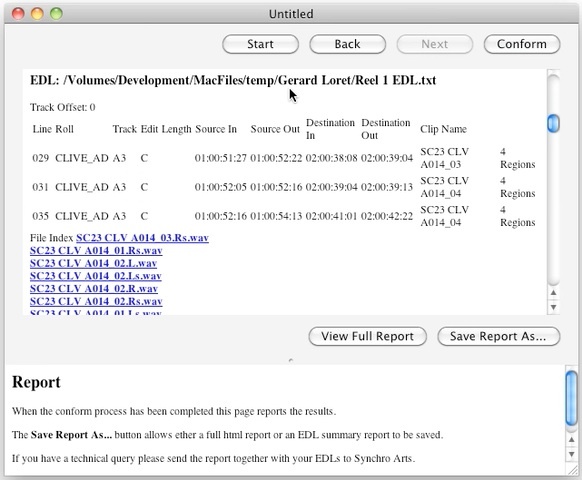 Regions, Tracks and Sessions are automatically named from EDL and user-supplied information. 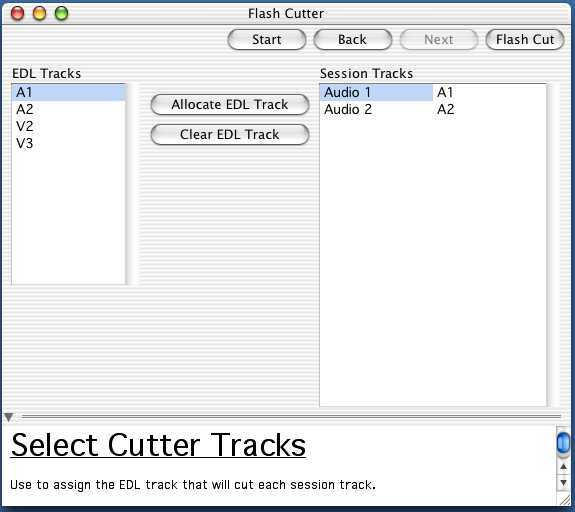 This addition to Flash Cutter allows user-selected tracks in a Pro Tools Session to be Cut into sections defined by EDL events source In/Out times which can be moved to new positions with starting points defined by each EDL events' record (or destination) In time. This allows blocks of audio to be repositioned instantly and automatically. Each Cut (and move) event in the EDL can operate on multiple regions, fades and tracks at the same time. Given the original EDL used to confrom a sesison and a new EDL from the video editor Titan can calculate the re-cut and a re-confrom EDLs. Flash Conform can conform audio loaded into hard disk and DVD drives from audio editors or location recorders. It supports a wide range of reel/roll and time code identification options. An unlimted number of audio channels are supported. Audio channels can be identified in may different ways. It can create Pro Tools and AES31 sessions. Titan 3.1.4 is included with Titan 4 to provide legacy support. 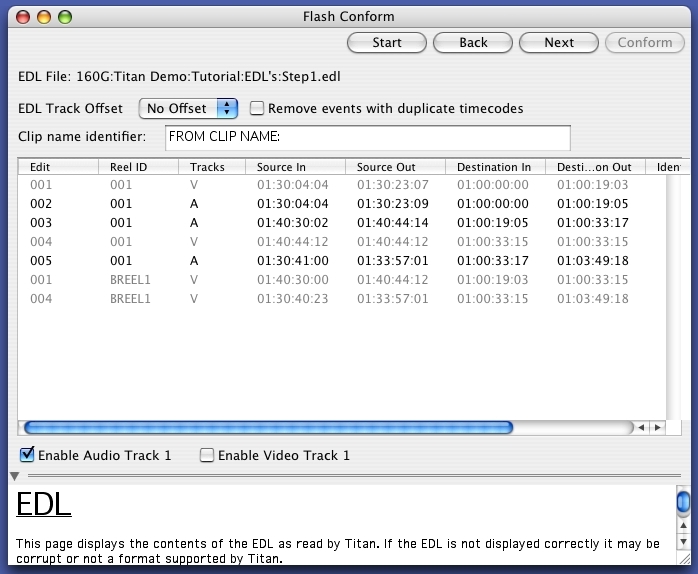 Media for the Flash Conform And Cutter Tutorial example is available on the Titan CD. It is not available for download due to the size of the media.